Opt for the Royal Service at this luxury all-inclusive resort in Mexico. The pyramid architecture of the Paradisus Cancun. Late January we said goodbye to the cold Canadian weather and hello to sunny Mexico. Our final stop? 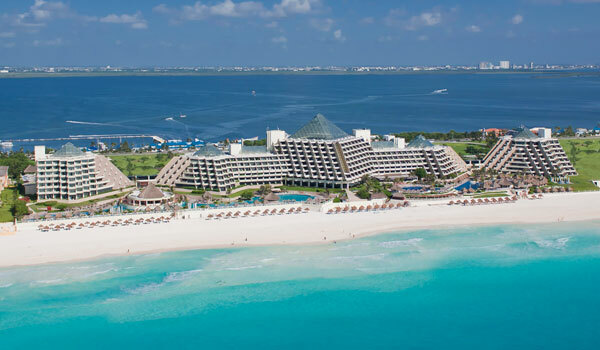 The newly opened Paradisus Cancun. 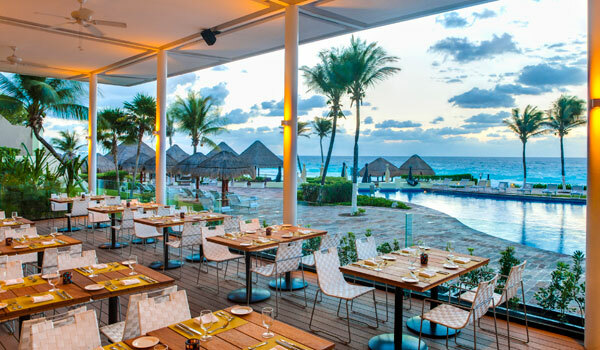 Formerly known as the Grand Meliá Cancun, parent company Meliá Hotels International took the aging resort and gave it a celebrity-sized facelift to meet the high design standards of Paradisus Resorts. 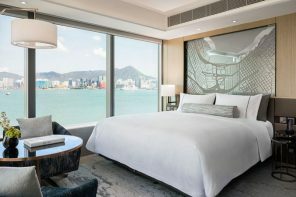 Rooms were renovated and updated with new decor, restaurants totally revamped, and an entire atrium completely transformed into a lounge and restaurant. With a total of 678 suites, the resort is hardly small, although the only time it actually feels large is when you are walking throughout the property. For the most part you don’t run into many people (beach aside), besides the occasional guests en route to a meal or staff going about their duties. Plus with eight restaurants to choose from, meal time never feels packed, which is likely why reservations are required. The private check-in lounge in the Royal Service area. We had the pleasure of enjoying the Royal Service experience, which we highly recommend. The adults-only suites come with some pretty sweet extras which start the moment you check in at the private, air-conditioned lounge. As a Royal Service guest you by-pass the front desk and get immediately whisked to the private Royal Service area, which is separated with glass doors and can only be accessed with your room key. During check-in, we were also introduced to our Butler, who would be available to us during our stay to help with things like unpacking, escorting us to restaurants and things like that. Other Royal Service extras? 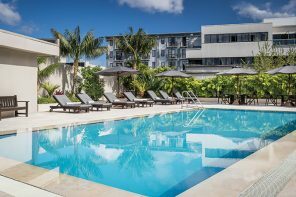 Complimentary Wi-Fi, daily continental breakfast, evening cocktails and hors d’oeuvres, and our favourite — a private pool and beach area with concierge service. Lounge chairs by the ocean. Tip: Book your private cabana bed as soon as you can because the best beds are the first ones to get reserved. We tried to get a beach-facing one, but the only time one was free was the day we were leaving. But no matter what you’re guaranteed to have a bed at least twice during your stay. One thing you’ll notice the moment you arrive, is the impeccable service. We were consistently impressed with the level of attention from the staff. Almost everyone we encountered was so sweet, attentive and just all-around friendly. As you pass by staff on the resort, you’ll likely notice them putting their right hand on their heart. This is their way of saying, we’re honoured to have you and is a sign of thanks. So be sure to smile right back! A Junior 2-bedroom Royal Service suite. 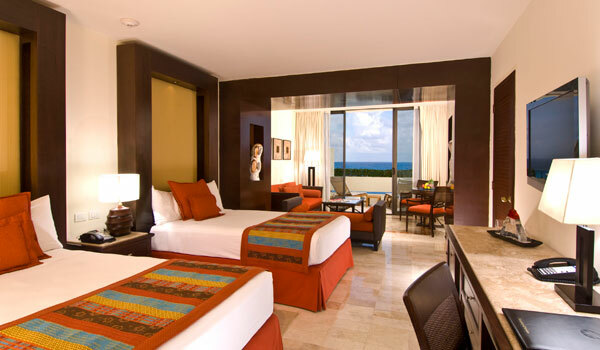 Our room was modern, yet cozy and featured a spacious terrace with 2 lounge chairs and a stunning ocean view. 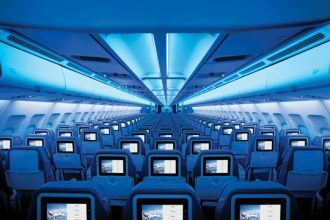 Though we didn’t spend much time in there, we did appreciate the little details, including the fully stocked fridge with plenty of bottled water, the nightly turn-down service, Clarins bath toiletries, and an air conditioning system we could control. Plus having 24-room service was a definite plus, especially after a few too many margaritas in the lounge or when you’d rather have breakfast in bed. 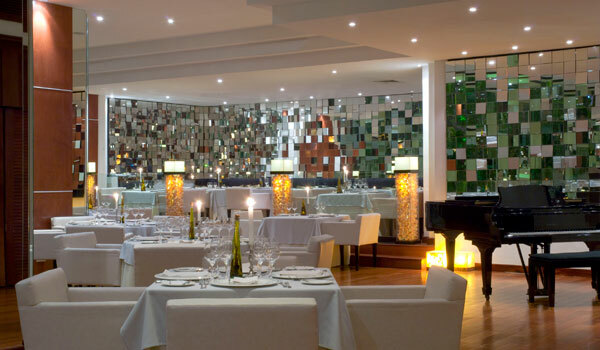 The elegant atmosphere at Tempo Restaurant. Dining-wise there was so much to choose from we didn’t actually get the opportunity to try every restaurant. One of the highlights by far is Tempo by Martin Berasategui. 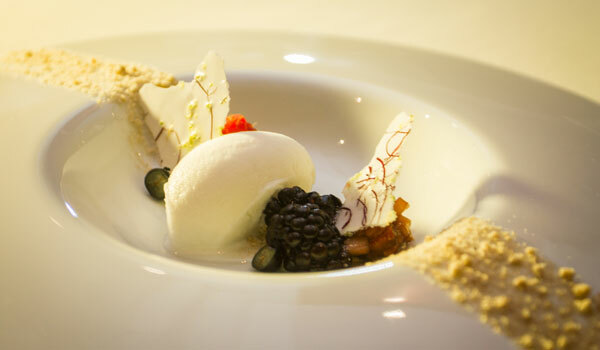 The restaurant is a gastronomic experience for those who truly appreciate fine food. With 7 Michelin stars under his belt, including 3 stars from his restaurant in Spain, Chef Martin Berasategui created the incredible 8-course tasting menu, which takes a full three hours to enjoy. While Chef Berasategui may not be “in the house” the chefs who prepare his dishes have all be taught by the master himself. One of the eight tasting courses at Tempo. Even though the dishes are small, eight courses are a lot, so definitely come with an appetite! It’s hard to pick favourites, but if we had to we loved the Baked Sea Bass with Broken Potatoes, and the Red Infusion with Goat Cheese Ice Cream (pictured). Tip: This particular restaurant is an extra charge, but for those adult guests who stay more than seven nights in Royal Service or Family Concierge get to enjoy a complimentary meal. Sunrise at The Market Grill Restaurant. Royal Service guests can enjoy a continental breakfast in the private lounge, but we always went to The Market Grill, where we could enjoy the gorgeous view and also order a freshly-prepared omelette. Dine on fine Mexican cuisine at Mole. Besides the incredible fine dining we had at Tempo, our other favourite restaurant was Mole, which served up authentic Mexican cuisine. 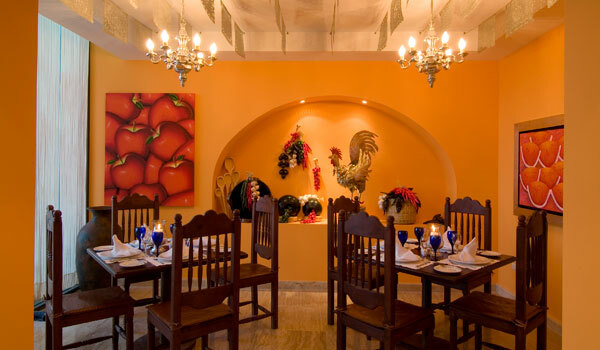 We loved the decor, the delicious food and don’t be surprised if a Mariachi band comes to serenade your table. If Mexican cuisine is what your after, there is also Blue Agave, which is a tequileria and cantina, serving up more casual dishes, including tacos and where you can also enjoy some tequila tasting! One of the most visually impressive restaurants of the bunch is Bana. 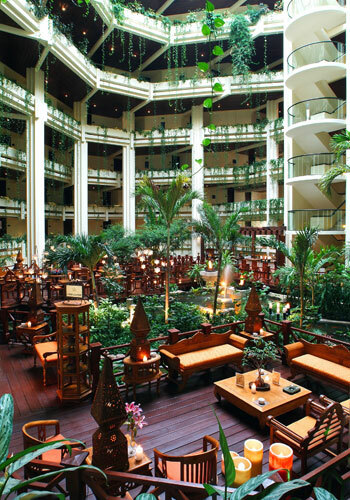 A contemporary Asian restaurant situated in the atrium, the menu featured dishes from all over Asia. Think sushi, curry and rice, spring rolls and dumplings. While we definitely appreciated the sushi chefs preparing the fresh sushi, overall it was a bit of a miss food-wise for us. Our suggestion is skip the food, but stay for the atmosphere. 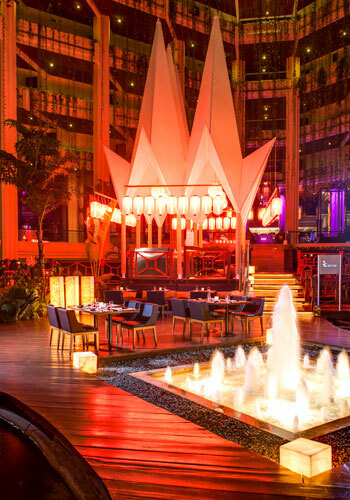 Paradisus Cancun also boasts three bars and lounges, including Red Lounge, which stays open until 2 a.m. and has a live D.J. spinning nightly. 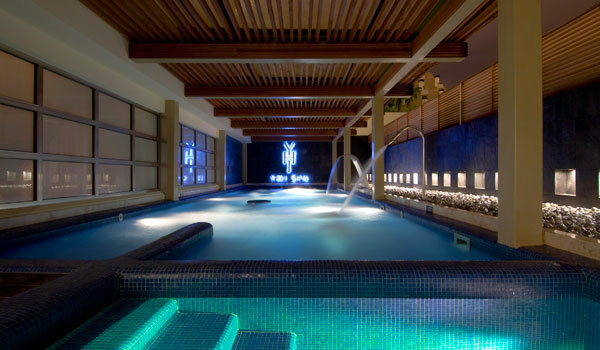 The Water Ritual area at the YHI Spa. To take that relaxation to the next level we hit up the on-site YHI spa for a relaxation massage. The spa offers a long list of treatments, from facials to body treatments, and there is even a hair and nail salon (perfect if you’re thinking of having a destination wedding here). The spa also features a unique water ritual zone, just off the co-ed relaxation area, where you can take part in the ancient-old hydrotherapy treatment. In addition to the spa area, there is also a large wellness centre for those who want to burn off those endless mounds of chips and salsa being delivered to your cabana. The gym is better than your basic workout area, with multiple treadmills, elliptical machines, strength machines and free weights. We also saw a huge studio where they offer yoga, spinning and aerobic classes. The only downside was there wasn’t a ton of classes available. For example we only saw yoga on the schedule once during the entire week. If being cooped up inside isn’t your idea of a workout, you’ll also find a 9-hole golf course, tennis courts and let’s not forget the pools. The beach from our perspective. Last, but certainly not least, between those amazing meals and relaxing spa appointments, you’ve come to sunny Mexico to get in some beach time. We promise it won’t disappoint. The beach offers tons of space, so you never feel like you have to cozy up to a stranger. There are plenty of lounge chairs and umbrellas, and there are always staff coming over to make sure you have what you need — whether that’s a margarita or a fresh towel. If we had to point out a negative, the beach is a busy place. Since the resort is in the hotel zone, it’s hotel after hotel, lining the shore. Technically the beach is public space, so there are often locals walking up and down selling things like hats, jewellery and para-sailing adventures. That being said, it’s amazing for people-watching and is the perfect strip to take a long walk or even a run. 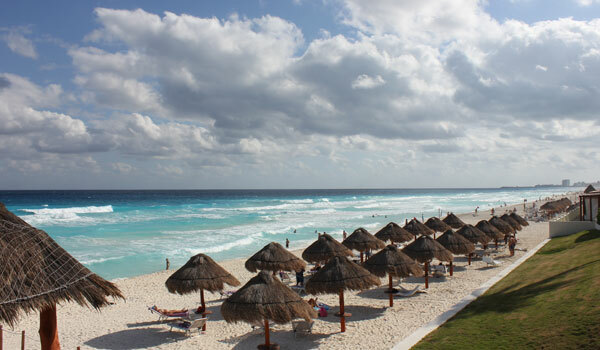 Overall we thoroughly enjoyed our stay at the Paradisus Cancun. We loved chilling in the private cabana bed in the Royal Service area, dinner at Tempo and the thoughtful service. If you’re looking to take your next all-inclusive vacation up a notch, this is where to do it. 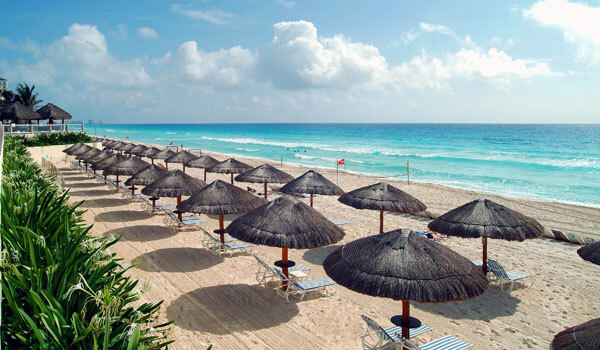 Paradisus Cancun is only 15 minutes from the Cancun International Airport (CUN) and 20 minutes from downtown Cancun.